SoftPlanet makes it possible for everyone to get free Vitainterface download directly from our servers. There is no registration needed for downloading. Vitainterface 2014 1.0.7.8 is a convenient and complex application, which is appropriate for these users who want all the necessary tools within a single user-friendly interface. Internet Services, Social Networks, Online Shopping, File Management, Media Services and Gadgets are some of its available features. You even have 2 GB of storage on the Online Drive. 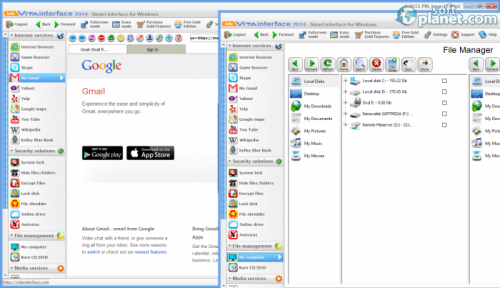 Vitainterface 2014 1.0.7.8 provides you with the ability to protect your personal data from unauthorized access by locking both your entire system and external drives. You are able to hide information, which you consider critical in order to protect it from illegal usage as well. You even have access to online radio, online news, movies, social networks (such as Twitter, Facebook, Google+, etc.) and so on. SoftVit LLC provides you with your own storage space on the Online Drive – 2 GB. All you need to do in order to get all this is to create an account. 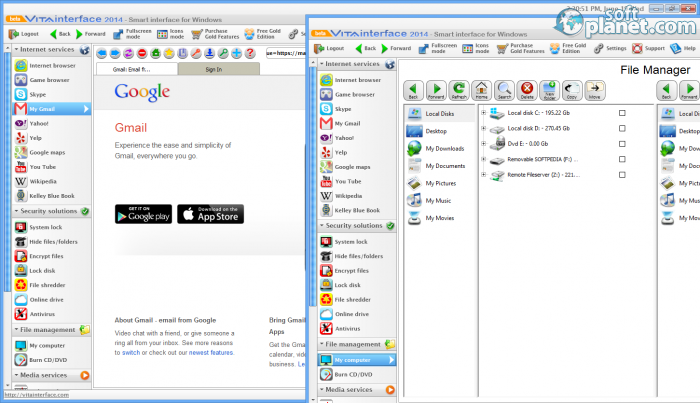 Vitainterface 2014 1.0.7.8 is a unique all-in-one secure interface for your computer, which includes useful tools like File Manager, Online Drive, Security Tools, Media Player, etc. It also comes with a built-in web browser that supports HTML5. Unfortunately the trial version has some features, which are disabled by default like Hide Files and Folders, File Shredder, Lock Disc, System Lock and Encrypt Files. In order to enable them you need to purchase the program, just for $29.99. Our security scan shows that Vitainterface is clean from viruses. The current version of Vitainterface has been scanned by our system, which contains 46 different anti-virus algorithms. That ensures that Vitainterface 2014 1.0.7.8 is 100% safe for your computer.